You’ll hear this and much more this coming weekend (see below for another preview)! On Friday, we return to where it all began 8 years ago: Bower Hill Community Church in Mt. Lebanon. 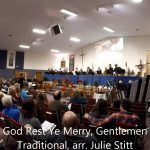 Saturday, we return to Center Presbyerian Church in McMurray, church of our own Linda Boice. And Sunday we look forward to our first appearance at Perry Highway Lutheran Church in Wexford. See you soon for one of these free concerts!